There was a time when the name Jack Thompson inspired loathing, anger, and even fear in the hearts of gamers. He was the industry's number one enemy, a giant killer, relentless and indefatigable, who would stop at nothing to get his way. Until his antics in and out of the courtroom grew so bizarre and offensive, that is, that he was disbarred permanently, with no leave to apply for reinstatement. All of this is relevant because, back in the days when Thompson mattered, his number-one target was Grand Theft Auto, and that epic conflict forms the basis of an upcoming movie called The Game Changers, which is set to debut on BBC Two later this month. 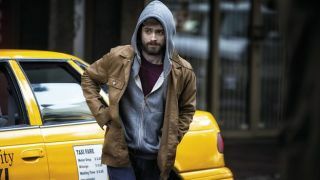 A Beeb docu-drama may not sound like the most thrilling thing ever, but this one stands out because it stars Daniel Radcliffe as Rockstar co-founder Sam Houser, and Bill Paxton as Thompson. Radcliffe, of course, is famous for portraying Harry Potter, while Paxton is a Hollywood character actor stalwart who's been doing good things since the early '80s. Also, as the BBC explained in May, Rockstar parent company Take-Two Interactive filed a trademark infringement lawsuit against it over the film, saying it wanted "to ensure that our trademarks are not misused in the BBC's pursuit of an unofficial depiction of purported events related to Rockstar Games." Which probably only had the opposite desired effect of making people want to see it more. The lawsuit doesn't appear to have had any impact on its release, however. The Gamechangers is slated to make its debut on BBC Two on September 15.